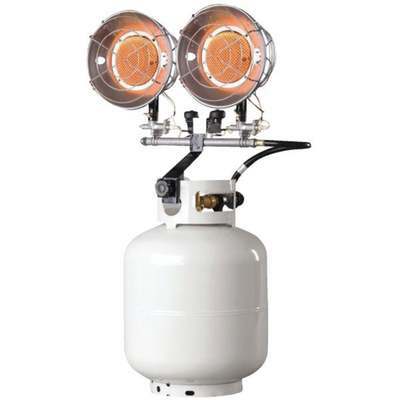 Radiant 10,000 - 30,000 BTU liquid propane tank top heater is the perfect solution for a variety of outdoor heating applications. Easy to use and quick to set up. Heater is constructed with high quality chrome and stainless steel components to deliver reliable heat on the go. Adjustable high-medium-low regulator and soft nose P.O.L. Adjustable swivel head design pus heat precisely where needed. Higher grade mesh bring longer lasting durability. Two tip-over safety shut-offs. Operate one or two burners for multiple heat output combinations. Mounts on 20 lb. propane cylinder. No tool needed, hand wheel installation. All components replaceable. Up to 24 hour run time.